Ryan Parris — a student at Acadia University in Nova Scotia — was named the McDonald’s Athlete of the Week. 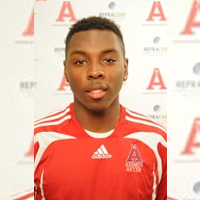 The Axemen soccer team remain undefeated after picking up their second tie of the season and improve to 2-0-2 after three weekends of play. Second year midfielder Ryan Parris was integral in the team’s scoreless tie versus the high flying first place Cape Breton Capers. From Pembroke, Bermuda, Parris defensively protected the back line, broke down the Capers midfield play and then distributed the ball well. Parris won his midfield battles against the highest scoring team in the conference thus far this season.